Securities Exchange Board of India (SEBI) cautions investors not to invest in ‘Collective Investment Schemes‘ offered by the entities that are barred by it. It has issued a press release on 29th July, 2015 and provided the list of such barred business entities or companies. These companies are not registered with SEBI and have been collecting funds / mobilizing money without filing the ‘offer documents’ with SEBI. As per SEBI, appropriate actions have been taken against these companies and its Directors. As part of interim directions, SEBI inter-alia directs the entities and its Directors to stop collecting further money under existing / new schemes, not to launch any new scheme or float any new companies/firm to raise fresh money, not to divert or alienate any assets or money collected. As part of final directions, SEBI directs winding up of unregistered schemes of the entities, repayments to investors and inter-alia also debars the entity and its Directors from accessing the Capital markets. What are Collective Investment Schemes (CIS)? A Collective Investment Scheme (CIS), as its name suggests, is an investment scheme wherein several individuals come together to pool their money for investing in a particular asset(s) and for sharing the returns arising from that investment as per the agreement reached between them prior to pooling in the money. Investors and general public have been cautioned not to invest in ‘Collective Investment Schemes‘ offered by the barred entities. How to contact SEBI and give feedback on CIS cases? SEBI has provided a facility to share your grievances regarding Collective Investment Schemes. If you have been duped by any of the above entities, you may contact SEBI and share your feedback. 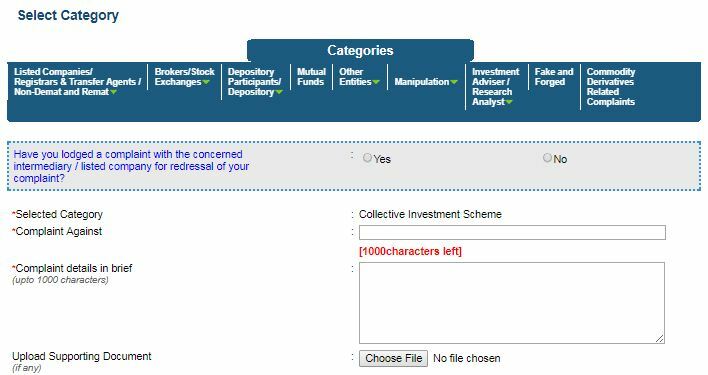 Select the option ‘Collective Investment Scheme’ under ‘Relating to’ field and share your grievances / feedback with SEBI. RESPECTED SIR, ALL INVESTER ARE WAITING FOR NEXT HARD ACTION REGARDING ( GARIMA HOMES & FARM HOUSES LTD.) WTM/PS/40/EFD/MAY/2016 WHO CHEAT ALL INVESTER , EMPOLAY . WHO COMPANY ARE NOT FOLLOW ANY ORDER OF SEBI . SO I REQUESTING PLS. TAKE HARD ACTION AGAINST THIS TYPE ALL COMPANY AND ISSU HARD GUIDE LINE WITHOUT WAISTING ANY TIME. RESPECTED SIR, CAN I ASK YOU REGARDING PR NO. 92/2016 WHO ORDER PASSED ON GARIMA REAL ESTATE & ALLIED LTD BY SEBI. I AM WAITING FOR NEXT HARD STEP ON THIS CO. WHO CHEATED ALL INVESTER. ALL INVESTER ARE DEPENDED ON SEBI FOR SOLVE THIS PROBLEM . AND WHAT IS THE NEW HARD GUID LINE FOR INVESTER ,AGENT,COMPANY, & CO.STAFF WHO INGUEGD IN THIS FROUD TYPE COMPANY. Thank you very much, sir for rendering such an important advice. SEBI has barred this company from raising deposits in the month of June 2015 itself. 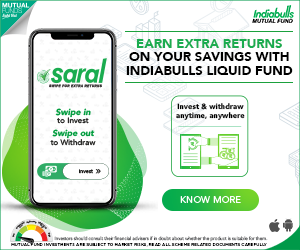 What is the main reason for you to invest such amount in this company’s scheme? Suggest you to submit your complaint to SEBI through the link provided in the article. Dear sreekanth reddy sir, I have invested money in SAI PRAKASH PROPERTIES DEVELOPMENT LTD now I am in need of money but its office in my city was closed 5 month ago so please help me sir how I can recover my money. Dear Jitendra..Kindly first submit your grievance with the company. If you do not get any response then file a compliant with MCA/SEBI or take legal action. I think Andhra Pradesh govt is going to auction the Agrigold’s assets and repay the depositors. Kindly try to educate as many people as possible about these kind of bogus collective investment schemes. 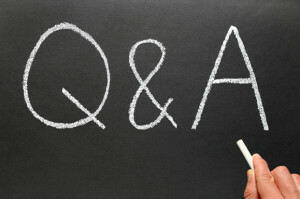 I kindly request you to advise me about UTI Nifty and Sensex ETF, whether is good or best to invest. Dear Chokkalingam..let me know your investment time-frame?? Sir I invested 2 lakh in PACL but they didn’t give me back pl how to get it back pl tell me. Nothing much can be done. You may have to deal with them legally. Do you know any other investors who have been cheated by them? If so, form as a group and approach them. Also, as given in the article, do write your feedback about the PACL deposit scheme to SEBI. I believe that it is now very tough to get back your money. What are they saying to the depositors like you? Are they willing to repay atleast the principal amount?